One man is on a mission to make people look up to the sky and appreciate the vastness and beauty of our universe and our place in it. 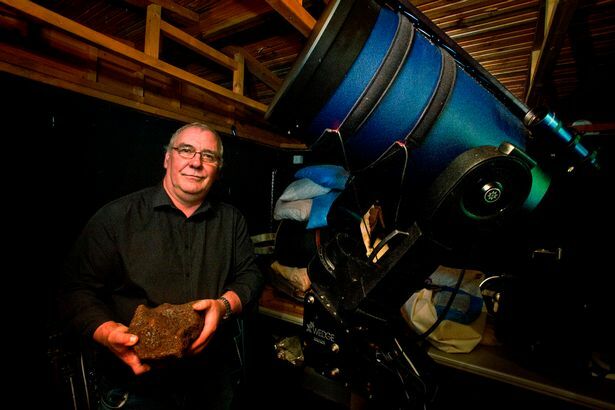 Dr Grant Mackintosh has been running the Tolcarn Research and Educational Observatory – which he built out of his own pocket – on the edge of St Austell for three years and already hundreds of school children, science students, cubs and beavers have paid him a visit to gaze a celestial bodies in all their glorious beauty. “To see the reaction and expression on a child’s face when they look at Jupiter or the rings of Saturn for the first time, is like liquid gold,” Grant said. “We only know about 2% of what’s out there. Every time you look through the telescope you will see something different. It is so special. Grant is so passionate about astronomy, star gazing and celestial movements it is infectious. Born in Edinburgh, he joined the Army and did a tour of Iraq during the First Gulf War in 1991 before being deployed to the then Yugoslavia in 1995 with the parachute regiments attached to the 7th Armoured Brigade. Grant was severely injured when his right hand was half blown up in an RPG explosion and all that was left of his hand were his thumb and one finger. After 14 years in the Armed Forces, he took his bow and left it all behind. “I’ve always been interested in astronomy, but when you’re in the Army you don’t have much time for hobbies. “The whole time I was in the Army I was on a waiting list for season tickets for Liverpool. I’m a massive Reds fan. Then when I left I got them. Grant set up and expanded his space observatory on a small holding near St Stephen’s with his Cornish wife Kim who works for Eden Project and whom he met six ago when he came to Cornwall on holiday for the first time. The observatory, complete with classic domes and huge telescopes and the computer power to analyse and render the images and data from his night sky observations, will undergo a massive upgrade over the coming weeks so it becomes an even bigger and better educational resource. “I nearly uprooted back to Scotland a few months ago,” Grant said. “The broadband is so bad and I’ve been in a battle with BT to get the internet speeds I require. They wanted me to pay £2,000 for four poles and then pay some more for the privilege of using them. “I was that close to going back to Scotland when I saw an article in the West Briton about this Satellite internet communications company Avanti based at Goonhilly.